ROVSUN Auto Commercial Ice Maker is ETL approved. We attach great importance to the quality of our products, every ROVSUN unit is well built and tested to ensure safety and longevity. This unit is made of durable stainless steel, rust resistant and prolongs its service time. 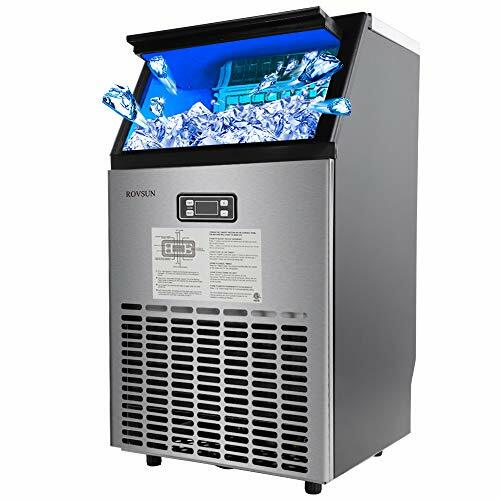 If you are looking for quality Commercial Ice Machine, this is a top pick. Rapid ice making, 12 to 18 min cycle, produces up to 100lbs of clear ice cube per day, ice cube size is 0.9''*0.9''*0.9'', the storage bin is able to hold 33lbs of ice at a time. Elegant and compact design, freestanding or built-in application, the unit doesn't take up much space, fits perfectly under a counter or in a kitchen cabinet. Suitable for home, restaurant, bar, hotel, grocery store, cafe, supermarket, etc. ETL APPROVAL: We go above and beyond to provide the top quality product. This ice maker is ETL certified so you can be confident that you're receiving a safe, efficient and well built appliance. Stainless Steel Construction not only prevents rust but also prolongs longevity, black frosted anti fingerprint panels make the unit more upscale. HIGH EFFICIENCY: Rapid ice making, produces up to 100LBS of ice per day in 12-18 minute cycles. 33LBS large storage capacity, ice cube size is 0.9''*0.9''*0.9'', the thickness of ice can be controlled freely. COMPACT DESIGN: Built-in or freestanding application. Fulfills commercial ice-making needs, great for home, restaurant, bar, hotel, grocery store, cafe, supermarket, etc. USER FRIENDLY: Installation is a breeze, only need to install the pipe. Smart panel is easy to use and set up, tips on the machine make operation easier. Equipped with an automatic cleaning function. Energy saving and low noise, you can run the unit overnight. PRODUCT DETAILS: Unit Dimension:18"x16"x31"(LxWxH), Ice Making Power: 270W, Net Weight: 63lbs. 5 accessories include ice scoop, water inlet hose, drain hose and 2 connectors. View More In Ice Machines.